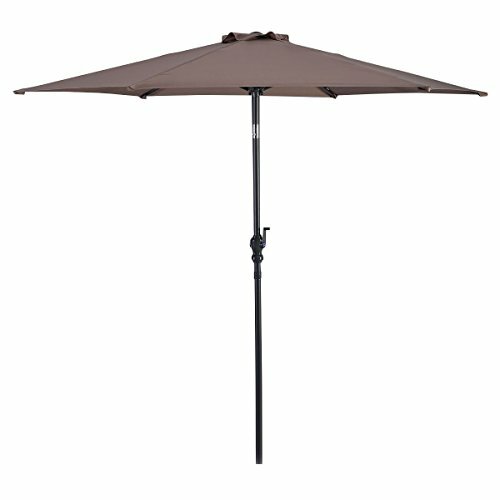 This Is Our 10 FTPatio Umbrella, Sun Tent, Rain Shelter, And More All In One, The Parasol GivesYou Instant Portable Protection From The Elements Regardless Of Your Activity.Add A New Partner To Make You Happy Journey, Just Take It Home ! 【Giantex Multipurpose Umbrella】6 Firm steel ribs construction support the canopy stably, stable for a beach umbrella, sun tent, rain shelter. 【Easy Tilt Operation】Push button tilt and crank system for umbrella, easy tilt operation with push button for more angles with hand-crank lift. 【Novel Design】Large hexagonal shape measures, the design is novel, fine workmanship, good quality and style vogue, high grade. 【Convenient Installation】Setup and storage is hassle-free with the detachable pole and crank handle, umbrella base not included.